Lynzie and I have been busy all week preparing for her Revolutionary War era tea party! Last night was the big event and it went so well! Lynzie has been planning this party for the past 6 or 7 months. Her little sister Selah was super excited to be invited to her first tea party! One of the fun parts of our preparation was making all the treats! Here's my Aunt Donna's "family famous" recipe for Creme Wafers. **Mix with a spoon and chill slightly. Roll dough out, 1/3 at a time, and cut into 1/8 in. thick circles. The lid from salt shaker or small spice jar works good as a cookie cutter. You want these 1-1/2 in. around or so. Dredge both sides in sugar and lay on a cookie sheet. Prick with a fork to make a design on top if desired and bake 7-9 minutes at 375. You want to take them out when they're set but not browned. Cool completely and then fill with frosting to make sandwiches. I like to use a quartered version of this recipe. Aunt Donna uses a cream cheese frosting recipe. Lynzie received several nice gifts from her friends including a porcelain doll, vintage and new books, a tea cup and saucer set, knick-knacks, and crafting supplies. Here she is opening a Barbie doll from Selah. The girls enjoyed lots of period-authentic treats, as well as Raspberry Tea and punch. Back in "those days", they would hide a bean in the cake and whomever got the piece with the bean in it was named King or Queen of the party. We hid a pink jelly bean in this white cake and Gabriella (below, closest to the camera) was named Queen for the day! After treats, the girls played many, many (MANY) rounds of Hide the Thimble. I have been so excited all week to link up again with Bubbly Nature's Project Party Weekend! When I woke up this morning and realized the week had gotten away from me (again) and I had nothing to post, I declared our homeschool "closed due to an outbreak of the crafting bug!" Last week, Rachel posted this great tutorial on Vintage Beanie Hats and I really wanted to try it out. Luckily, I had everything I needed to create a few for my girls. They love them! 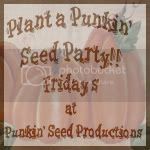 Visit Bubbly Nature Creations for more Project Party Weekend links! I received the most thoughtful gift the other day from my good friend Rachel. She was reading one of my past blog posts where I talked about the set of Pyrex bowls that my mom gave me. When she came across a vintage blue Pyrex refrigerator dish (with the lid!! ), she decided that I just had to have it. So...she boxed it up and sent it to me all the way from Oklahoma! What a sweetie! I first met Rachel online in 2004 on an email group. Though we've never met face to face, we've become close friends and have shared the births of several babies (each!) as well as job changes, moves, and more. She is one of my dearest friends---one that I know will be a lifelong source encouragement and inspiration! In fact, it was Rachel who designed my super-cute blog! 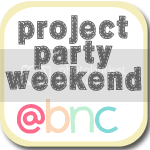 She blogs at Bubbly Nature Creations and has just kicked off a new blog party called, "Project Party Weekend". Everyone is invited to showcase their recent projects and recipes. She is always a source for great ideas so please take a minute to check out her adorable blog. Thanks so much, Rachel, for your kindness to me! I look forward to many more years of friendship. And...who knows? Maybe someday we'll actually meet each other! Visit Smiling Sally for more Blue Monday! The ministry of Jesus was about inclusiveness, peace, and love. His main group consisted of men but many of his followers were women and he did not discriminate against anyone. Women of less reputable status, such as Mary Magdalene, are mentioned as well as his mother. After his death, the new church became an "exclusively male dominated one and women were denigrated to a subservient role. So my question becomes why did the followers of Jesus, who must have seen their leaders treatment of women decide to place them in this role? Why has it remained to be this way in many denominations of Christianity?" I think the question that needs to be asked is: are we interpreting the entire historical past based on the "rights" women think they have been entitled to in just the last 80 years or so? Just because a group of feminists that are only as old as Grandma say that women should have absolutely equal status with men in all things doesn't make it true, nor does it make it what God intends for us. It is my assumption that women were placed under the leadership of men within the church because that is also the way it was in society. Jesus treated women the way He did because He was setting an example of how people should be treated---not because He was trying to abolish the headship of the men in family, church and other situations. If Jesus had wanted women to take places of leadership over men, He likely would have modeled this by taking on some women in His core group of disciples or placed a woman in charge of his mother just before he died (rather than John---see John 19:26-27). It is only lately that women have got the impression that they are somehow being cheated by the church. Since the beginning of time, I am of the understanding that most Godly women were content to serve as faithful helpers and wise counselors to their fathers and husbands. Proverbs 31 spells out the characteristics of the "virtuous woman" and this used to be the standard for a woman to strive to achieve. It is not against Jesus' message of "inclusiveness, love and peace" for women to serve under the authority of their husbands or fathers. God's desire for men and women to walk out specific roles is all throughout the Bible. Even at the very beginning of the Bible, God makes their roles evident by putting curses on the specific things that they were "in charge of". Today's society sees these roles as a man domineering over his "subservient" wife. In fact, this is rarely the case. Men are given the responsibility of taking care of their wives and women are given the protection of their husbands. If this is not the way society is functioning then it's because society has chosen to walk off of God's path. If these roles have survived to this day in any denominations of Christianity, it's because people realize that it's a peaceful way to live and it's the way the Bible says God designed it. When lived the way God intended---with a wife respecting her husband and a husband loving his wife (see Ephesians 5)---this can be a very peaceful and fulfilling life for the whole family. Also, this doesn't really apply to your question but it applies to my answer: I would encourage anyone who's interested to really read about Mary Magdalene before assuming she was a woman of "less reputable status". There is no basis at all in Scripture for her being a former prostitute as many have implied throughout history. The only mention of her former sinful nature is in Luke 8:2, "Mary called Magdalene, out of whom had come seven demons." Many link her up with the prostitute in John 8 whom Jesus "rescues" from stoning. It makes for good romance that Jesus would rescue her and then invite her along for the journey. In fact, He sends that woman off to "go and sin no more". Just because Mary Magdalene was healed of demon possession doesn't mean she was a prostitute. I can think of seven demons in my own life right now---gluttony, fear, coveting, worry, unforgiveness, laziness, judgmental attitude---and I'm as straight-laced as they come! I am mentioning this because it shows something we are all guilty of. The point that I was trying to make to this guy is that if we bring to this class all our preconceived ideas and thoughts of what so-and-so said, it could block us from learning what history really does tell us about Christianity. We wouldn't form assumptions about science or math---we would search for the most accurate answers. Studying God's word should be a challenge to ourselves to find out what it really has to say---even if we don't like what we find out! New King James Version . Nashville: Thomas Nelson, 2001. Whenever I see a photo of Princess Diana, it reminds me of my mom. Those who know her will probably be surprised to hear that. 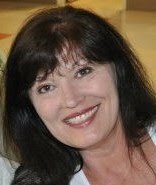 After all, my mom is a dark-haired, brown-eyed Potawatomi American Indian. 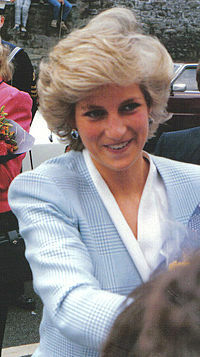 Princess Di was a blonde-haired, blue-eyed British Royal. It's not the photo itself that reminds me of mom---instead, it's the memory it conjures up. 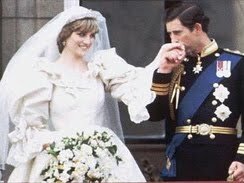 I can remember several times throughout my childhood that my mom would talk about watching Princess Di's wedding to Prince Charles on tv. She would say it was so beautiful and she really had looked up to her and thought she was a neat lady. I've never been all that into her, really, but the thoughts of my mom make thoughts of the Princess more meaningful, I guess. Today I was in Target and spotted the commemorative edition of USA Today that features Prince William's and Catherine Middleton's wedding plans. I almost didn't give it a second thought but then something inside told me to skim through it. As I looked over photos of the couple and their relatives (including several of Princess Diana), I was reminded again how much my mom liked her and probably would have loved to have some sort of commemorative publication featuring their wedding. So...I stuck it in my cart and went on to the next aisle. Then I went back and grabbed another for mom.